Stay Smart at Our Hotel Near Chattanooga, TN Nestled next to the Tennessee River near the Georgia border, Chattanooga, TN is a bustling city with tons of charm and character. East Ridge is located off I-75 and about 10 miles from Chattanooga, so you're within reach of all the wonderful sights of the city. The Holiday Inn Express Hotel & Suites Chattanooga (East Ridge) places you near the University of Tennessee at Chattanooga and local companies, including BlueCross BlueShield, Combustion Engineering, UnumProvident Corporation, McKee Foods and Volunteer Ordinance Works. 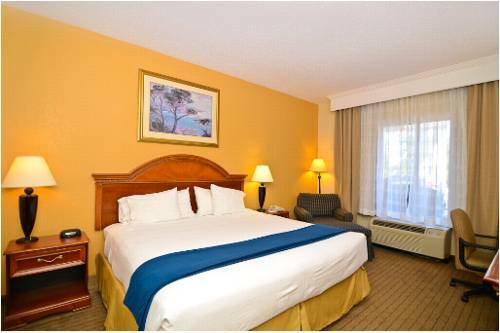 Our East Ridge hotel has a 24-hour business center and a spacious meeting room. Because our hotel's in East Ridge, TN, you're only minutes from busy, downtown Chattanooga. You can easily explore the riverfront, visit the Tennessee Aquarium, see paintings at the Hunter Museum of Art or take a boat ride down the Tennessee River. If you don't want to drive far from our hotel's location in East Ridge, TN, you can enjoy Camp Jordan Park and its indoor arena or play a round of golf at one of three nearby golf courses. We're sure that no matter what brings you to Chattanooga and East Ridge, our hotel and its friendly staff will make your stay comfortable. Our great amenities include an indoor pool, a 24-hour fitness center and our fantastic, complimentary Express Start breakfast bar. Make your reservations today to enjoy everything our East Ridge hotel has to offer! Cracker Barrell: Country Style Restaurent serving breakfast, lunch, and dinner. Bus parking available. Wally's Restaurant: Well known locally owned resturant serving great southern fare. Portofino Italian Restaurant: Selection of Italian and Greek dishes. Pizza Buffet. Buy one get one free on carry out pizza! Chili's Grill and Bar: Full service Tex Mex, steaks, and seafood. Full bar with daily drink specials. AmtrackServing most of the continental U.S., Amtrack combines safety, speed, and comfort for travellers. Accomodations ranging from shared seating to private traincars available. Moccasin Bend Golf Club18 hole championship course near the Tennessee River. 6,469 yards from back tee. Par -72 bentgrass course. Numerous water features.